Money is an inescapable part of life on earth – and an inescapable part of marriage. From wedding expenses to new homes to children’s education to retirement funds, finances are always involved in the life of a family. In fact, finances are one of the greatest points of contention in marriages; according to Money Magazine, over 70% of married couples fight about money more than anything else. Phil Lenahan, who is married and has counseled thousands of couples about money issues, knows this tension all too well. His book is the fruit of hard work in helping people trust God with their lives while being wise about their money. Lenahan writes, “My purpose in writing this book has been to help you bring balance and peace into your financial life, no matter what stage you find yourself in” (p. 19). This approachable book is saturated with the Faith, including ample use of Scripture verses as well as quotes and anecdotes from saints. Each chapter contains a wealth of practical guidance on topics like setting a budget, making big purchases, and paying off debt, ending with a “Freedom Dividend” that makes suggestions tor applying the material to one’s own situation. 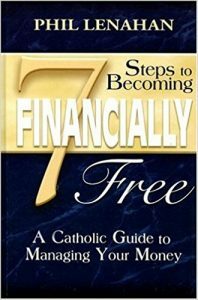 Part 1 of the book is entitled “Faith and Finances.” Lenahan begins with a Catholic understanding of life, faith, and finances, looking at all of these things with the next life in mind. As Catholics, the way we live must be influenced by God’s love and commands. The words of Christ in the Gospels, “you cannot serve both God and mammon,” still ring true today. It is sometimes tempting to acquire more goods, earn more money, and fall into greed and selfishness. But, as Lenahan emphasizes, God has a plan for our finances – a plan that will ultimately lead to freedom and peace. The first part includes a few sections on particular aspects of life: marriage, children, and work. Married couples are called to be not only one flesh but also one mind and heart, including when it comes to financial decisions. For parents raising kids, Lenahan emphasizes the importance of teaching children good money habits and attitudes from their earliest years. He includes suggestions for different age groups, such as paying your child for tasks done around the house and having your teen play a part in determining the family budget. In regards to work, he focuses on the goodness of work and how any act, for our family and for God, can be an act of service and love. This part concludes with a breakdown of tithing – the how, when, where, and why to tithe part of your income. Eliminate Debt – Accelerate It! This relatively straightforward plan is an excellent means for setting financial goals and having a healthier relationship with money. Each person’s plan will vary slightly, and some readers may find that they’ve previously gone in order or jumped ahead. Regardless of where a family is in terms of their finances, Lenahan strongly believes that financial freedom “all starts with a plan” (p. 95). The first, and most important, step in this plan is developing an attitude of stewardship, which involves “recognizing that all you have ultimately belongs to God, learning to be generous with the tithe as your model, applying temperance to your lifestyle, and developing effective communication in your marriage” (p. 91). A couple’s finances won’t magically solve themselves, but with that perspective and hard work, the groundwork is laid to tackle the more difficult parts of financial life. An attitude of stewardship and trust, rather than possession and fear, permeates Lenahan’s steps. The range of topics covered in this book is incredibly broad, from personal money personality, to a special note for employers and entrepreneurs, a spiritual plan, guideline budgets, types of insurance, and the best way to invest your money. Lenahan tackles it as both expert and friend, guiding the reader along with solid advice and occasional tough love. Seven Steps to Becoming Financially Free, published in 2006, could benefit from a few updates in statistics and on the topic of technology (at the time the book was written, only 18% of families had the internet in their home; according to Pew Research, approximately 80% do now). Not only does technology add monthly costs, but there is a wealth of online banking opportunities and budgeting apps and programs available. However, this hardly detracts from the content and its presentation. While economic jargon can be confusing and overwhelming for those without a finance background, the language Lenahan uses is approachable and understandable. Whether you’re engaged and looking ahead at combining finances with your future spouse, newly married and beginning to tackle debt, wanting to improve a family budget, or simply looking for a solid financial resource, this book is invaluable. Caty Long is a second year Master of Theological Studies student at the Pontifical John Paul II Institute and currently an office assistant for the Secretariat of Laity, Marriage, Family Life, and Youth at the USCCB. She will be married in August 2018.